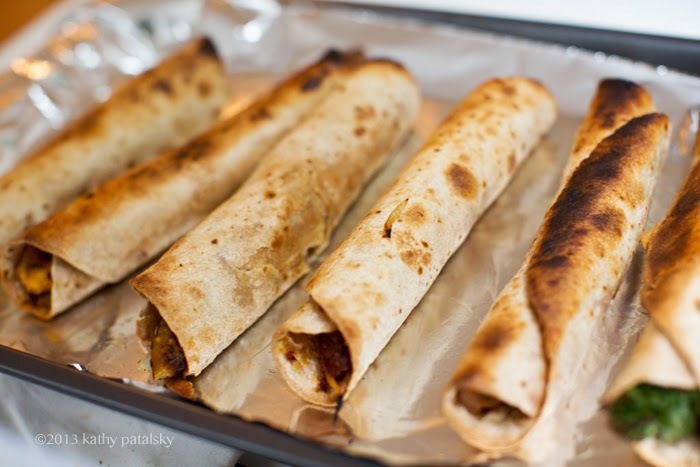 Taquito Tuesday! 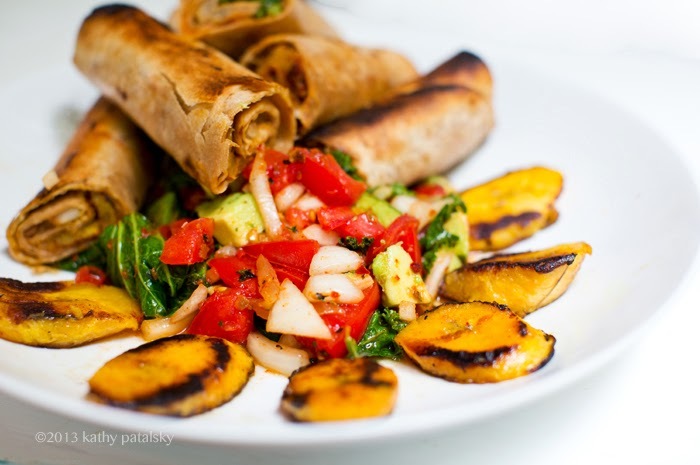 "Fatty Taquitos" + Warm Mexi Kale Salad & Plantains. 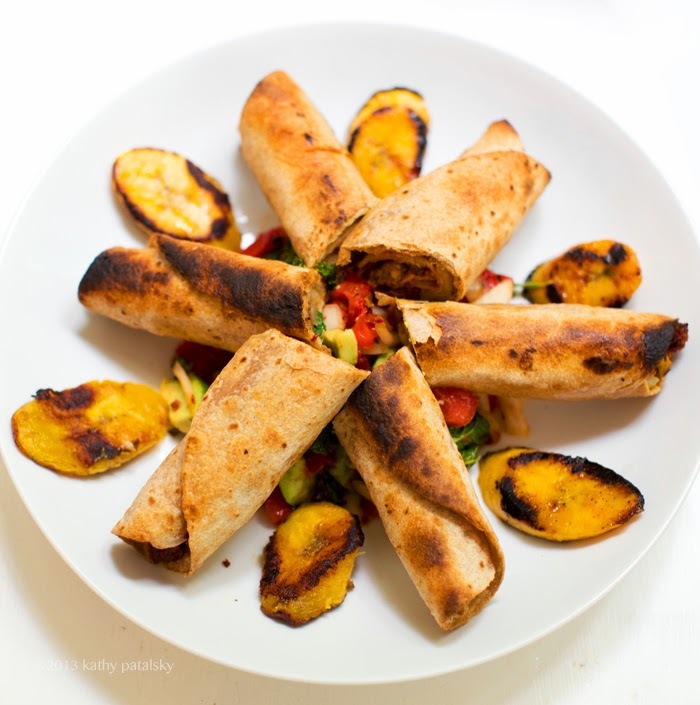 I lovingly call these tortilla spirals stuffed with yummy-amazing ingredients, Fatty Taquitos. 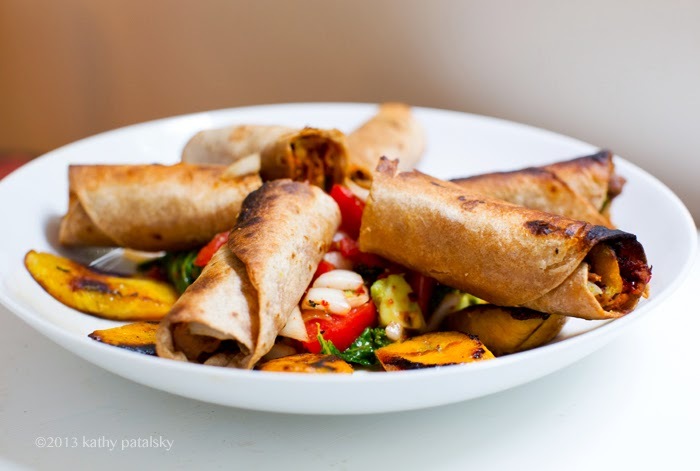 A baked, over-stuffed version of the beloved Mexican appetizer dish "taquitos." 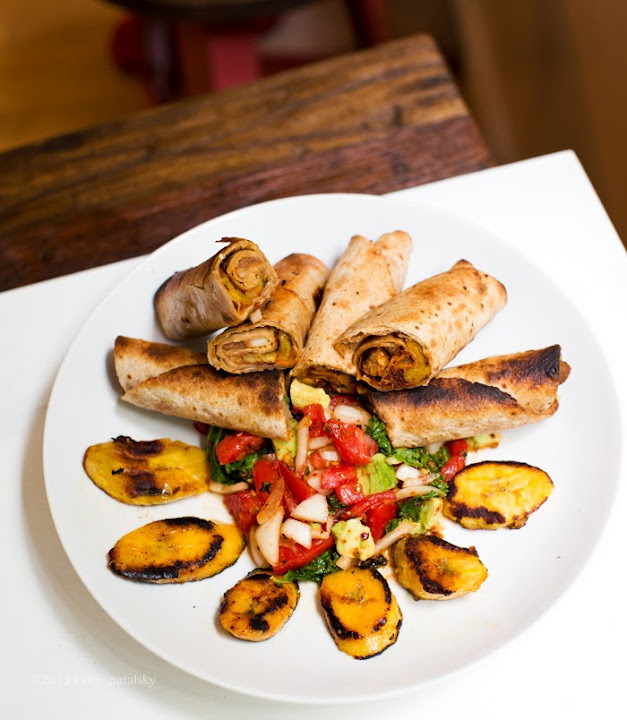 I paired these delicious bites with a warm Mexican Kale Salad and some slices of sauteed plantains - one of my favorite side dishes ever. 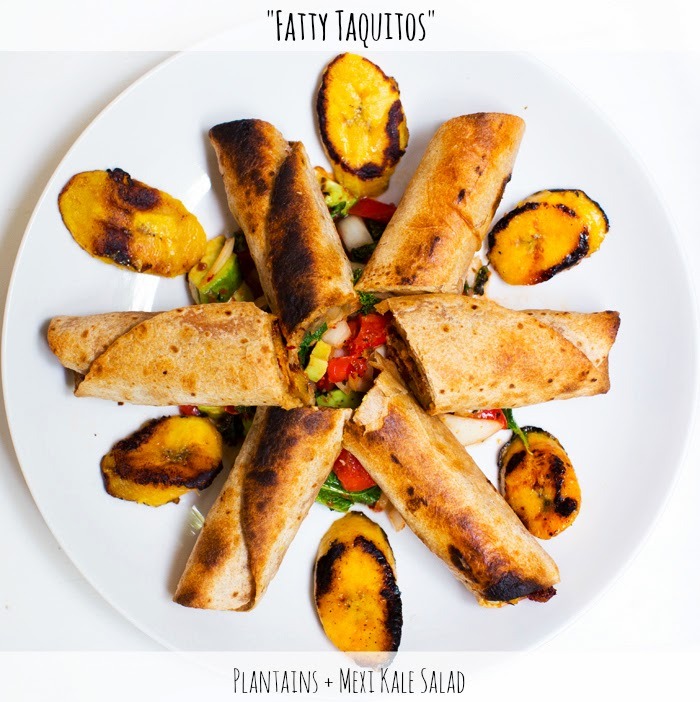 Sweet, tender plantains with crisp caramelized edges accent the spiced, fresh salad and hearty fatty taquitos perfectly. Taquito makeover meal accomplished!.. Nicely filled. Not too much, not too little.. 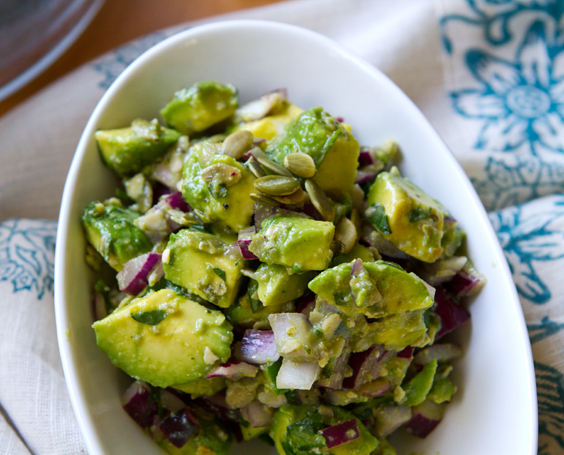 Pair with some sunny pumpkin seed guacamole if you'd like.. 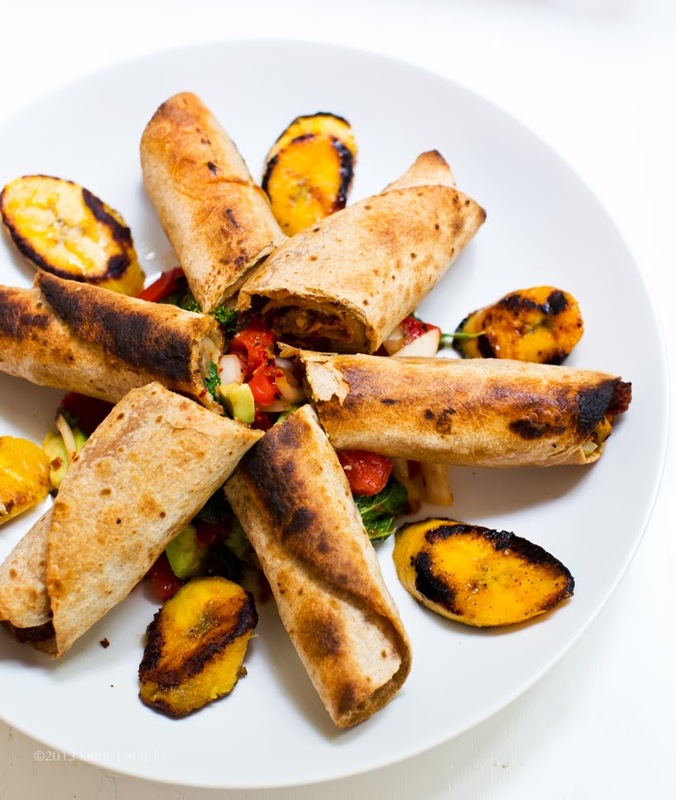 I love taquitos, but there are a few problems with making them into a meal..
1. They are usually fried. 2. They are usually quite skinny with very minimal "filling." 3. Usually the filling includes things like cheese and even meat. Not terribly vegan-friendly, let alone entree friendly. So I made a few minor changes, added a delish Mexican Kale Salad and suddenly my beloved guilt-infused fried appetizer turned into a healthy meal! 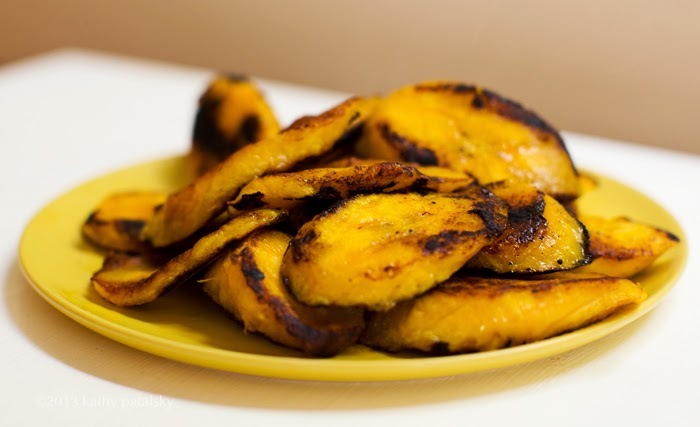 Directions: Over high heat, warm oil and add plantains. Saute for 1 minute. 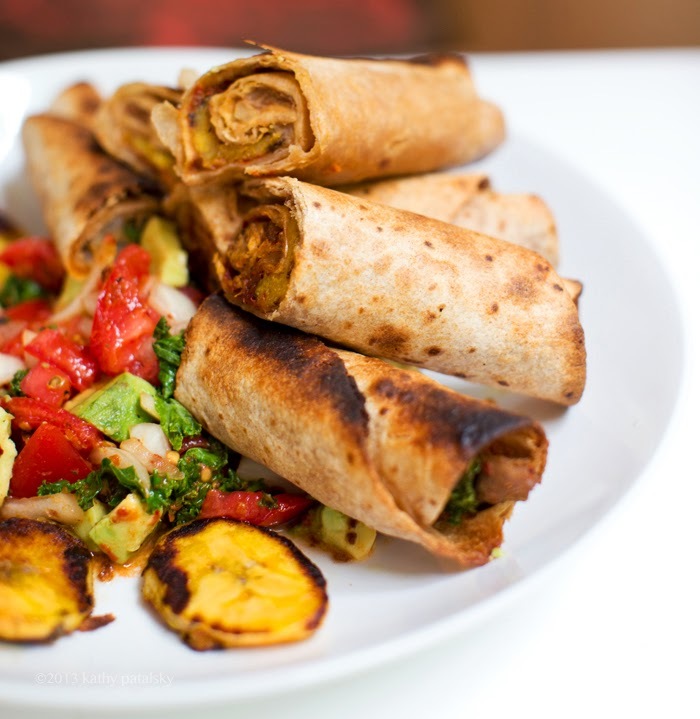 Flip plantains and add sweetener and spices. Cook for another 1-2 minutes or until the edges begin to blacken. Remove from pan and cool on a side plate. 1. After you saute the plantain, leave the excess oil/sweetener in the pan (do not clean pan after plantains - this adds much flavor to the kale.) Add another 1/2-1 tsp oil and heat pan over high heat. 2. When pan is hot, add the torn kale to the pan, rub the kale into the oil/pan to coat the leaves a bit in the flavor. You can flip the kale around a bit. Cover pan with lid. Allow to cook/steam for about one minute. You just want to slightly wilt and toast the kale. You do not want it to be soggy, but still springy after a quick warming. Remove cover. Flip kale leaves a bit and add the tomato and onion and spices. Toss well. 3. 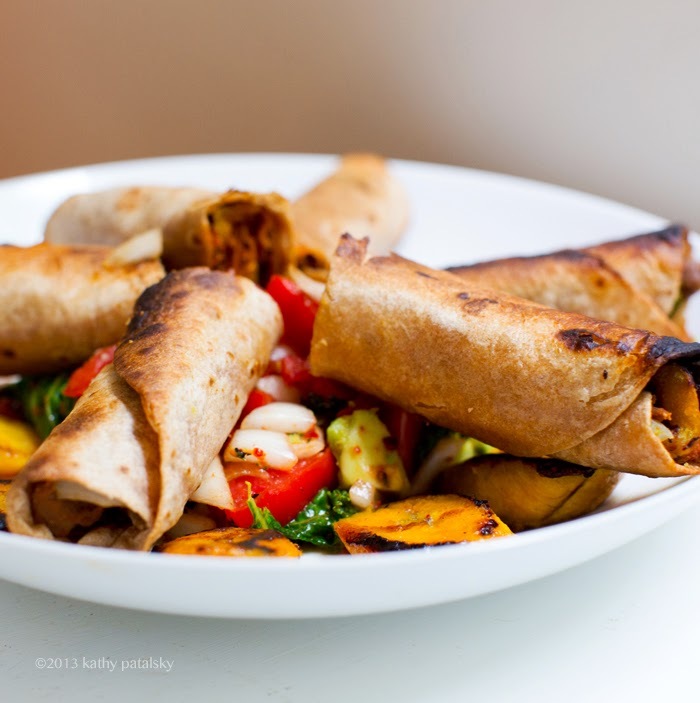 Remove kale and veggies from heat. Add the avocado and lime juice and toss a bit to evenly distribute flavors. 4. 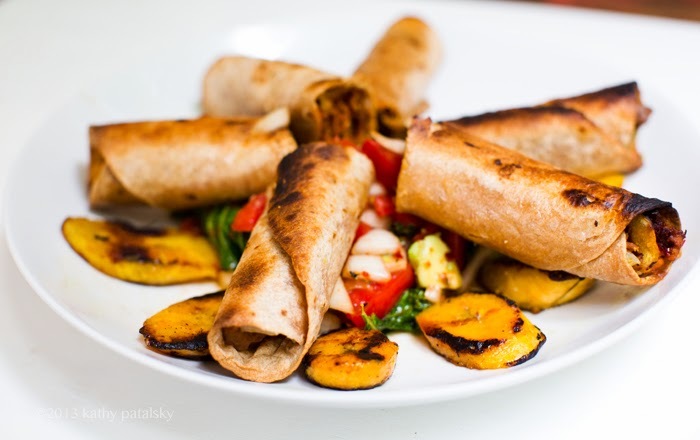 Set aside and plate with finished taquitos. 1. Preheat oven to 400 degrees, line a baking sheet and spray with oil to grease. 2. Warm your beans and prep your veggies if needed. (I used leftover veggies from my salad prep. 4. 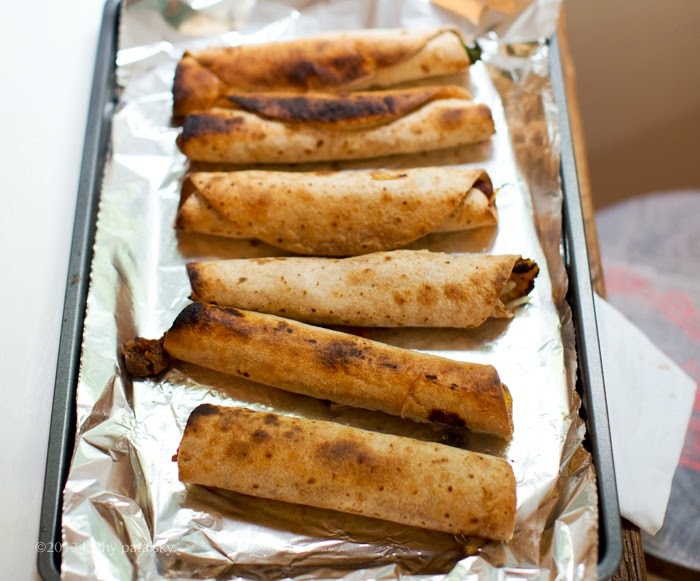 Roll each taquito and rub the outside of the tortilla with oil. Place on your baking sheet. Continue until all tortillas are filled and rolled. 5. Bake at 400 degrees for 15-20 minutes or until the edges begin to brown and become toasty and crisp. 6. 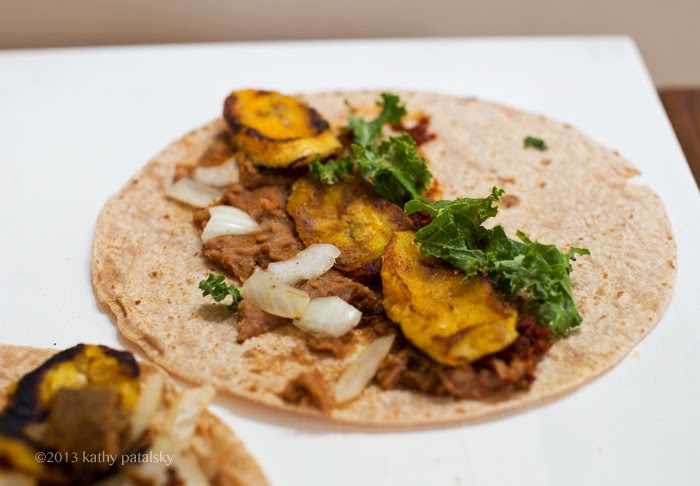 Cool, slice and serve with plantains and kale salad.